How do you follow an Olympic Games opening ceremony? As his new thriller Trance arrives in cinemas, director Danny Boyle talks about going back to the day job, being dubbed a national treasure and whether he'd be tempted to tackle James Bond - again. 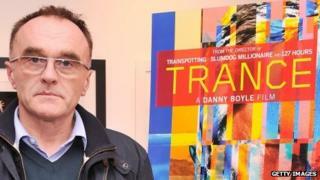 Danny Boyle and I go way back. Well, back to last summer anyway, when I - along with thousands of others - was a volunteer performer in his London 2012 opening ceremony. It is fair to say the director played a more significant role than I did in that memorable occasion. Yet when I mention my involvement, the Oscar-winning film-maker could not be more enthusiastic. "Brilliant!" exclaims the British mastermind behind last July's spectacular montage of industrial revolution, dancing nurses and parachuting heads of state. "We did all right, didn't we?" Most would consider that an understatement. Indeed, the Olympic curtain-raiser over which Boyle presided is ingrained in the public consciousness as a triumphant testament to our history, culture and sense of humour. Small wonder that, as a result of his endeavours, the affable Lancastrian behind such film successes as Trainspotting, 28 Days Later and Slumdog Millionaire is now routinely described as a national treasure or hero. It is not, however, a description that sits well with the 56-year-old, who recently confirmed he turned down the knighthood he was offered in the New Years Honours. "I get self-conscious, and self-consciousness is the absolute enemy of story-telling," he explains in a hotel suite in central London. "What you're doing should be about the story that you're telling. It shouldn't be about your reputation or position, so you have to find a way of dealing with it." It would have been easy, and perhaps tempting, to bask in the glory of the opening ceremony and soak up every plaudit and accolade that has since come his way. Yet Boyle took a different tack, opting instead to complete work on Trance - a psychological crime thriller he shot in London in 2011 in the run-up to last year's extravaganza. Though the film itself was 'in the can', several months of editing, scoring and visual effects work remained to be done before it could be released this week. The post-production process inadvertently helped him avoid the feelings of vacuity and despondency he had warned volunteers like myself during rehearsals that we might come to experience once the event was over. "What I didn't realise is how completing something that was half-finished would fill that gap for me. I think I'd have found it very difficult to start again, from scratch." A dark tale of art theft, sexual obsession, torture and violence, Trance was deliberately conceived as a corrective of sorts to the ceremony's inspirational, optimistic exuberance. "We made it as kind of a relief," Boyle nods. "Because you had this very national, celebratory, family-friendly responsibility, it was lovely to be able to occupy a different, darker part of the brain. "It's like a nasty cousin of the opening ceremony if you like - and definitely not the kind of film you'd want to be talking about as a national treasure." "I think shooting this movie was a way for Danny to take his mind off the Olympics," says Vincent Cassel, the French actor who - along with Scotland's James McAvoy and American actress Rosario Dawson - helped the director bring Trance to life. "He managed to switch from one thing to another without letting us know. The only thing where I could see the difference was we had to work at weekends." Like Boyle's 1994 feature debut Shallow Grave, Trance deals with three central characters - an auctioneer, his criminal associate and a female hypnotherapist - involved in a clandestine conspiracy. Where Shallow Grave dealt with flatmates divided over a suitcase of money, however, Trance revolves around a priceless painting whose disappearance sets the protagonists on a collision course. "There are not many films where you get three stonking great parts where they are battling it out to see whose film it is," Boyle continues. "The central idea is a puzzle the three characters are trying to solve." Yet that puzzle is also one that the audience are invited to decipher - provided, of course, they are prepared to put in a degree of effort. "Demands are made of the audience to keep up, to keep picking up the breadcrumbs and to follow the trail through the film," the director explains. "We designed everything about the film as an act of seduction - to pull you into it and make you work towards the final resolution." Lest anyone mistake Trance for an exam, though, La Haine star Cassel is keen to stress that the film is "smart" as opposed to "complicated". "I think the map of the movie is very clear," the French actor tells the BBC News website. "It does challenge the audience, but more on an emotional level." The question of what Boyle's next challenge will be remains unanswered as yet. It has been suggested, though, that he might be in contention to direct the next James Bond film. With Skyfall's Sam Mendes ruling himself out of the job there is a vacancy to be filled - one that might appeal to a man who already has a mini-Bond adventure under his belt. Having directed Daniel Craig - and HM the Queen - for the opening ceremony's Happy and Glorious segment, is he tempted to throw his hat in the ring? It is a question that prompts a well-practiced response. "I wouldn't be disinclined, but I'm not really the right guy to make those kind of films," says a director whose sole link to date with so-called 'franchise' cinema was a brief flirtation with the Alien series. "I like working slightly under the radar, rather than the responsibility of having to deliver to a certain expectation." But have the Bond team been in touch? With a chuckle, Boyle nimbly deflects the question by repeating that he "wouldn't be the right kind of person to do those kind of films". I'm a little disappointed to be honest. After all we went through together last summer, you'd have thought he'd be more forthcoming. Trance is out in the UK and Ireland on 27 March.